With those words, Elizabeth Warren cemented her reputation as a person who knows how to speak to Americans about progressive values in a way that seems to have eluded almost every other public figure in America. There’s just something about the way she talks in plain prairie English that makes people listen – and scares even the most hardened businessman and compromised politician into paying attention. Now she’s declared her candidacy in Massachusetts, hoping to parlay that ability into a seat in the most powerful big money club in America, the US Senate, and make them listen too. Her pitch is a modern day populism, aimed at the struggling middle class, the people who are dazed and confused by 30 years of conservative cant and free market policy that hasn’t worked for them as its been put into practice. She’s refined a story line about how this happened that’s both erudite and approachable, using her own history and scholarly work to weave a narrative about America’s economic crisis that speaks to people’s yearning to understand what happened – and feel some optimism that it can be turned around. Warren likes to tell the story of her grandmother as a way of illustrating what the conservatives think of as the “good old days” were really like (before Franklin Roosevelt turned America into a socialist paradise). She tells the tale of a young woman driving a covered wagon with her younger brothers and sisters all the way to to Oklahoma during the land rush to meet their father, who had staked out a parcel for the family. She married and she and her husband built one-room schoolhouses and modest homes, and as Warren calls it, “stretched and scratched” to succeed, only to have it all wiped out in one of the many busts of the early 20th century. So they started all over and built their lives up once more only to lose it all again in the Great Depression. That’s how it was in America in the good old days, boom and bust, no security, no solid middle class, no upward mobility for those who lose on the downside of the cycle. She points out that it was three specific laws that came out of the Great Depression that changed all of that and set the stage for the longest run of uninterrupted prosperity in the nation’s history: FDIC Insurance, Glass-Steagel and the SEC. – More than 40 per cent of Americans who are actually employed are now working in service jobs, which are often low paying. You can google dozens of similar statistics from sources all over the political spectrum. Until very recently, politicians in both parties have been very slow to address this problem beyond the early inadequate stimulus programme, instead spending months drawing up plans for further “shared sacrifice” on the part of the people, only stopping to argue about whether the rich should be required to kick in some insubstantial tip money or nothing at all. In the midst of that mess, Elizabeth Warren has arisen as an unlikely lone voice speaking out on behalf of the shrinking and increasingly desperate American middle class, first fighting against an army of financial lobbyists to create a new Consumer Financial Protection Bureau and now as a candidate for the US Senate. There was a lot of chatter among the political insiders about her day job as an academic being a huge liability and pedictably, her opponent Scott Brown ostentatiously refers to her as a “Harvard professor”. If there is one thing people consistently say about her it’s that despite her lofty academic position, she seems almost preturnaturally real. Political pros were also concerned that her lack of name recognition and political experience would be hard to overcome, especially in light of the fact that her opponent, incumbent Scott Brown, seemed to be reasonably popular. 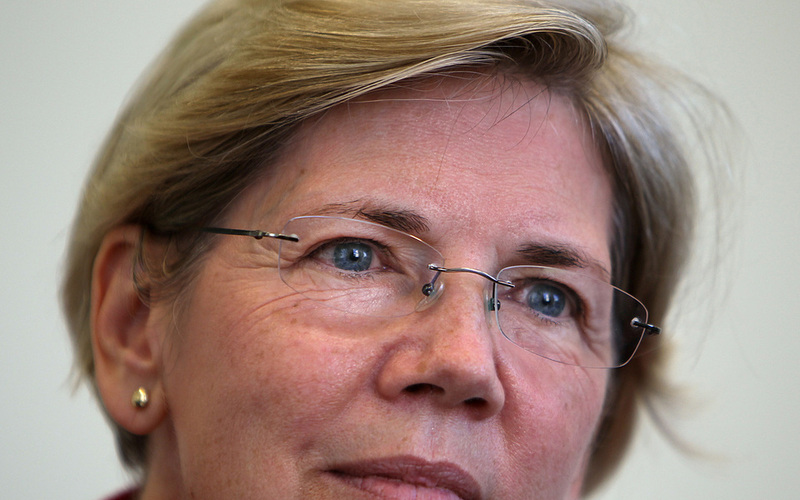 But in one week, Warren vaulted beyond all other aspiring Democratic candidates to a 46 point lead in the primary. And to the shock of just about every political observer in the nation, she also beat Brown in the first polling done since June, erasing a 15 point deficit to take a 46-44 point lead. Nonetheless, Brown is a formidable opponent around whom the Republican party is rapidly coalescing despite his occasional deviation from the Tea Party approved line. If there was any thought to launching a primary against him, it seems to have vanished. However, according to the New York Times’ most recent poll, people who identify themselves as Tea Party members are more likely to vote for someone they believe is electable than one who hews to their so-called principles, so perhaps this isn’t surprising. Still, Massachusetts is a Democratic state and if Warren can maintain the current enthusiasm among the voters, she could win. And that will mean far more than just another Senate seat for the Democrats. It will mean that one of the highest profile enemies of the moneyed elite in America was able to get elected by the people with a populist message. In times like these that sends a chill down their little pin-striped spines. The election is over a year away and there’s no way of knowing how well Warren will fare over the long haul. Electoral politics is a very tough business and none are tougher than Massachusetts. But Warren’s message is a potent one, expressing progressive values in terms that are almost intoxicating to the base of the Democratic Party, hungry as they are for someone to take up the cause of the American middle class, workers and families who are being unbearably squeezed and yet asked to give even more – even as the wealthy fatuously declare themselves to be “job creators” and therefore absolved of any duty to pay their fair share. The last thirty years of free market fetishism and crony capitalism have perverted that bedrock American ideal to something twisted and perverse. Warren is clearing out the cobwebs for a lot of people and giving them a different way of thinking about this problem. Win or lose the Senate seat, she is doing a service to the country by having the guts to face down the powerful and say what needs to be said. And it’s inspiring progressives all over the country, including, some say, the president himself. Heather Digby Parton writes the liberal political blog Hullabaloo. You can read her blog here. Unfortunately her opponent has been receiving obscene amounts of money from Wall Street. The money people do not want her in. They want their paid made man.